Understanding Sport Organizations: The Application of Organization Theory, Second Edition, a new edition of a ground-breaking text, continues to give readers a strong foundation in organization theory and application of that theory by providing a real-world context to all its issues. It engages readers by providing opportunities to discover the theory in practice through use of profiles, case studies, and examples of sport organizations in each chapter. A new chapter on strategic alliances explores the growing complexity of sport organizations and the impact that complexity has on the planning and decision making of sport managers. It will help current and future professionals recognize and understand the opportunities that exist both outside and within the sport industry to benefit their organizations. A new chapter on research in sport management prepares readers to become competent researchers by providing guidance on research design and methodology, data collection and analysis, and issues of quality. A new section in each chapter, titled “Key Issues for Managers,” details vital concepts that will help managers apply information taken from topics in the text to specific issues they face on the job. To enhance understanding and bring the material to life, Understanding Sport Organizations: The Application of Organization Theory, Second Edition, references numerous current examples. Each chapter opens with a practical example of a sport organization and closes with a case for analysis that allows the reader to directly apply the information from the chapter. Throughout the text, “Time-Out” sidebars present examples to illustrate specific concepts under discussion. The examples are effective in highlighting for students and professionals the many different areas in which organization theory occurs. The book also employs chapter objectives, summaries, key concepts, review questions, and suggestions for further reading for each chapter, guiding readers to a greater and more practical understanding of core issues. It also examines organizational goals, strategy, environments, culture, technology, power, conflict, leadership, change, and many other issues affecting sport managers. This new edition provides readers with opportunities to discover sport organization theory in practical terms and to apply the knowledge in real-world situations. It engages readers in the many different areas in which organizational theory occurs; it also recognizes the dynamic, increasingly sophisticated sport industry, both in academic and applied settings. Understanding Sport Organizations: The Application of Organization Theory, Second Edition, is an invaluable resource for students and practitioners alike. Is Conflict Dysfunctional to the Operation of a Sport Organization? 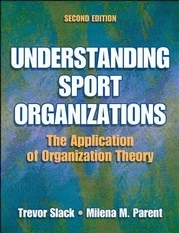 Textbook for graduate and upper-undergraduate courses in organizational theory as it relates to sport. Also used as a reference for practicing sport managers around the world. Trevor Slack, PhD, is Canada research chair of the International Institute for the Study of Sport Management at the University of Alberta in Edmonton, Alberta. Slack is widely published in major sport and organization journals and has presented as a keynote speaker at conferences on sport organizations around the world. He has been editor of the Journal of Sport Management and the European Journal of Sport Management, and he has been on the editorial board of several journals related to sport management. Slack has been awarded numerous grants for social science and humanities research projects. In 1995 he presented the Zeigler Lecture, the leading lecture in sport management, and in 2001 he was awarded a Canada Research Chair for his work in sport management. Milena M. Parent, PhD, is an assistant professor in the School of Human Kinetics at the University of Ottawa. Parent completed her PhD in the International Institute for the Study of Sport Management at the University of Alberta. She has experience as a national-level figure skater, a coach, and an administrator. Her doctoral research in sport management is on organizational theory and strategic management of large-scale sporting events. Parent is a coach for Skate Canada and a member of the Administrative Sciences Association of Canada, the Academy of Management, and the North American Society of Sport Management. She also serves as a reviewer for European Sport Management Quarterly and for the Administrative Sciences Association of Canada conference.